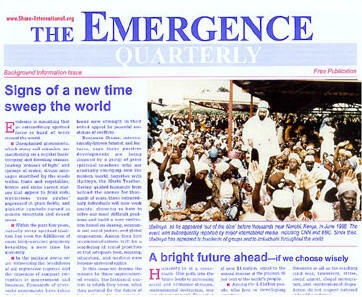 The Emergence Quarterly is produced by Share International (Amsterdam, London, San Francisco). It contains excerpts from Share International magazine and appears quarterly. It is a widely distributed free publication most notably in Africa, India and Asia. Its translated sister newspapers are also read in many parts of Europe and Latin America. The Emergence Quarterly is available in English, German, Japanese, Spanish, and Dutch. A special background information issue is available in these languages as well as in Arabic, Romanian, Hungarian, Italian, Swedish, Russian, Polish, Norwegian, Latvian and Portuguese. The tabloid-size newspaper also contains background information on the emergence of Maitreya the World Teacher, making it an ideal introductory piece. From 2014 onwards The Emergence Quarterly is available for free download in PDF format via the links below. For information about The Emergence Quarterly in other languages, contact the local group.